Transport of children will be the responsibility of individual parents. 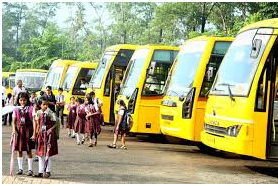 The school provides transport on all routes with excellent helper escorted facility. Approximate timing for each bus stop on various routes of our buses is given in the route chart. The routes and stops are ascertained on the basis of convenience to parents and their wards and they are subject to change from time to time on the basis of change in fuel prices.